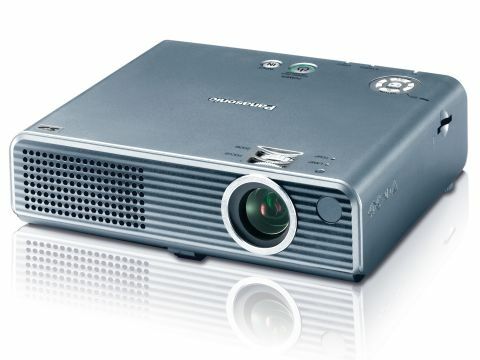 Panasonic has a range of Micro Portable LCD projectors that weigh upwards of 1.9kg, but the Panasonic PT-P1SDEA is classified as a home cinema projector, presumably because it doesn't support wireless communication. On the rear of the projector are VGA, S-Video and Composite video inputs, plus RCA stereo audio, which isn't ideal as most laptops use a mini-jack connection. On one side of the projector you'll find an SD card slot. The idea is that you load photos on to an SD card and then view them on a big screen, but the system didn't work for us. The card was correctly detected, but the files were invisible, yet we were sure that we had followed Panasonic's strict rules about placing the photos in the root directory of the card and naming the photos with conventional characters. Leaving aside that disappointment, when we ran a PowerPoint presentation we were bowled over by the superb appearance of the 800x600-pixel image. This projector isn't too large, so you can place it relatively close to the screen while still achieving a decent picture size. The picture is far better than some of its peers, with excellent colours and an image that is sharp and clear. We had to fiddle with the settings a little to avoid getting glare when viewing black text on white, but it was well worth it, and the results ensure the Panasonic stands head and shoulders above the others.